"Should there not be sufficient space for all sorts of curiosities which in the end the distinction between "physical" and "psychical" loses meaning?" dissertation surveys other visual artists' quantum-inspired attempts to blur the distinction between objective and subjective reality as well as describing her own works on this topic which include paintings such as Erwin's puss, video installations such as Kevin wondered if the Moon existed when he didn't look, experiments with a phantom-limb simulator, the Metaphase Typewriter Revival Project, projects using the Psyleron Mind Lamp and many more. Lynden was recently honored as Artist-in Residence at Crane Gallery in Philadelphia where she participated in a joint exhibition with conceptual artist Jonathon Keats. Next month (February) Lynden exhibits a sampling of her work as one final step in the completion of her doctorate degree. Here's Lynden's press release for her exhibit. Readers of this blog who live near Queensland, Australia, will have a rare opportunity to test their ability to "doubt conventional reality" in several imaginative quantum-physics-inspired contexts created and constructed by Lynden Stone. 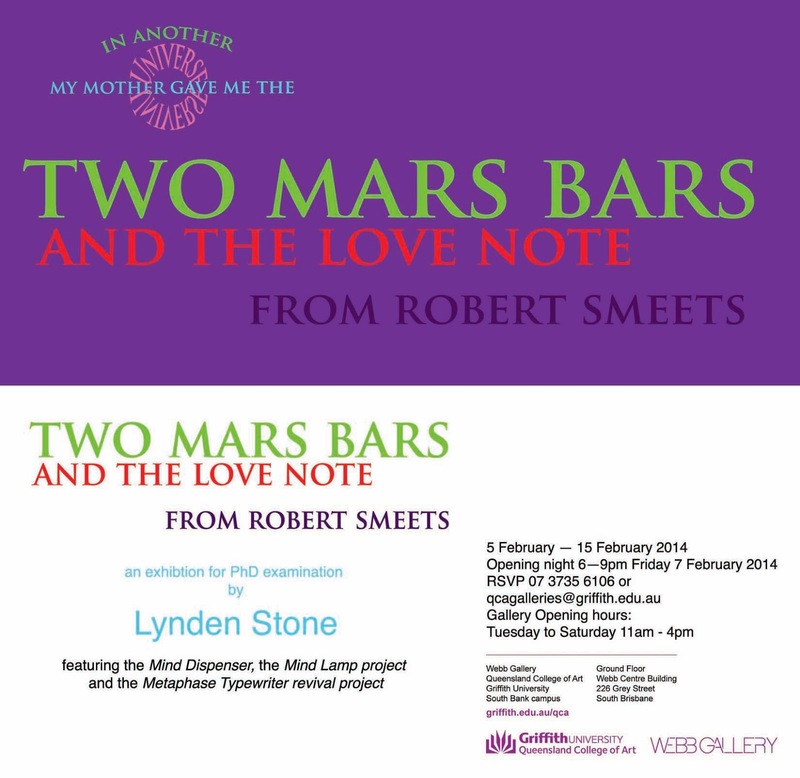 Two Mars Bars and the love note from Robert Smeets is the final exhibition by Lynden Stone for examination of her PhD in Fine Art at the Queensland College of Art. Based on the premise that quantum physics demands a re-evaluation of conventional reality, Stone sets out to challenge the viewers’ conventional understanding of reality that is objective, mind independent and knowable. Viewers can test their ideas of reality by using, for example, the mechanical Mind Dispenser. 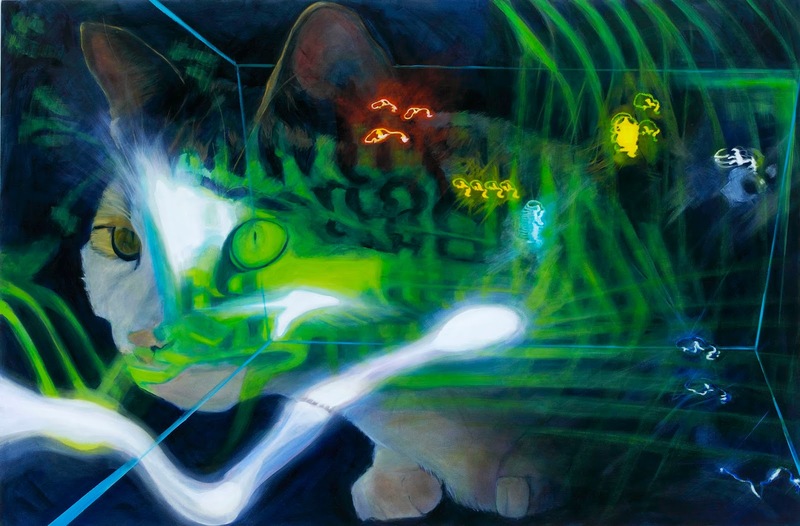 This work provides random quantum events that, arguably according to quantum theory, allow a viewer to select, in a race of gobstoppers, the colored lolly of their choice by using only their consciousness. The Mind Dispenser is a collaborative piece created by Stone and final year Griffith University engineering student Anderson Tepas and Professor Steven O’Keefe. The title piece in the exhibition, In another universe, my mother gave me the two Mars bars and the love note from Robert Smeets, 1993--2013, is a work concerning the quantum theory of parallel universes. This theory states that at every moment of choice, all possibilities manifest into multiple, branching universes. Stone presents alternate scenarios behind two doors of a kitchen cupboard. Behind one door is a representation of her parallel life where, rather than hiding the Mars bars and the love note in the kitchen cupboard, her mother did give her these things. In that life, Stone has lived as the wife of Robert Smeets in London Ontario, winning some minor painting prize for an underwhelming pastel still-life at the local show. Behind the other door is a representation of the life she has lead in this time-line. Two Mars bars and the love note from Robert Smeets is on show in the Webb Gallery, Level 1, Webb Centre, Queensland College of Art, 226 Grey Street, South Brisbane, Queensland from 5--15 February, 2014. Gallery opening hours are Tuesday -- Saturday, 11am--4pm. The opening night event is Friday 7 February, 6--9pm. Fascinating art pieces. Got me thinking some weird thoughts... or maybe that is the cold meds? Mr Herbert, I'll bet you've seen those maps of dark matter distribution that look kind of like neural networks. What do you think about this - could that be a great big cosmic brain ? it looks so reminiscent of organic networks - brains, veins, mycelium etc.